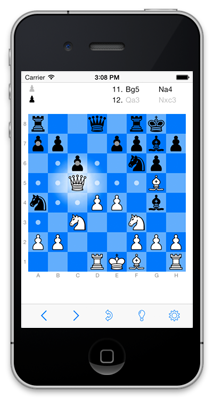 Starting with version 1.9, tChess allows you to play other tChess users over the Internet via a proprietary tChess server. To access the "Play online" feature, just tap the cloud button on the main toolbar. You can have up to 20 games stored on the tChess server and you can play each game as a real-time game, or a correspondence game (where you make moves at your leisure), or a combination of both. While playing an online game, you have access to a full compliment of features: you can offer a draw, request a takeback, resign, ask to switch sides (if it's the first move), and send your opponent short text messages.